Our Mustard of the Month Club features unique mustards from around the world! 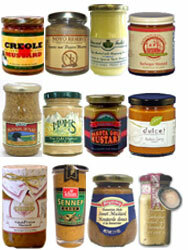 Every month, the mustard of the month club features interesting and hard to find mustards from around the world. Because of this, you won't find selections here that are widely available in the local grocery store. In fact, we frequently feature many medal winners from the World Mustard Competition that takes place each spring at the Napa Valley Mustard Festival. Some notable past selections include Sierra Nevada Stout & Stoneground (Grand Champion), Dulcet Cuisine Madras Curry (Grand Champion), Stone County Specialties Honeycup (Gold ), Brownwood Farms Famous Kream (Gold), Delicae Gourmet Sun-Dried Tomato & Olive (Gold), Gil’s Roasted Garlic Champagne (Gold), Diva Delectables Brash Balsamic Maple (Silver), Herbal Gatherings South Side (Bronze) and many, many more. The mustard of the month club is available in your choice of one jar per month or two jars per month.